Have an important occasion you would like to celebrate? 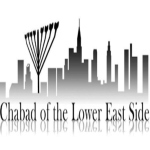 Why not celebrate with your community, and sponsor a Shabbat kiddush at Chabad of the Lower East Side. A regular weekly kiddush cost $250. | Special Kiddush please contact for information.